Up first I have a mini (90 mm) and a medium (135 mm) twice tempered handmade Czech glass files. These are etched on both sides and have a very fine grit. You can purchase fancier ones with Swarovski crystals, but you don't really need the extra accoutrements. These come housed in plastic sleeves which probably wouldn't last too long in my purse. No worries, they also have some files with a hard case for added protection. I'm going to be completely honest here; I've never had a better nail file. Ever. I've purchased ones from Sally's, Ulta, and CVS, and none of them even compare to the Mont Bleu. I am going to go out and purchase a few more for around the house and work. This is a glass dual-end cuticle pusher which can be used to lightly push back cuticles. It has a frosted finish with one flattened side to push back the cuticles and one pointed side to do a little cleaning under the nails. It works well, but make sure not to drop it! They also included several stainless-steel manicure tools made in Solingen, Germany. It is clear that these tools are well-made just after picking them up. They fit well in the hand without being too heavy. You need to be a little extra careful with metal tools to make sure you don't scratch the surface of your nail. Above you can see the smooth surface of the cuticle pusher. Above you can see the other metal tools that were sent for review. The cuticle nippers are extremely sharp and easily get rid of those pesky hangnails and dry pieces of skin that show up after you use cuticle remover. 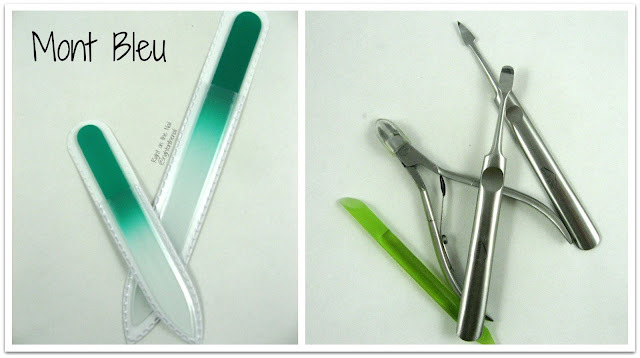 On the right you can see the stainless-steel nail cleaner which is perfect for cleaning under your nails. The best part? You can completely disinfect these between uses. I am very pleased with the Mont Bleu products. Their items work well and have a high quality with affordable prices. They were also kind enough to provide a 20% off discount code to all my readers with the code BLOG in their e-shop. Go ahead and shop their site right now, or head on over to Amazon if you want to purchase with your Prime Membership! For wholesale orders, you can find out more information here.